One of the many pleasures of our long weekend was meeting Lolo’s new puppy: Ike! Ike! 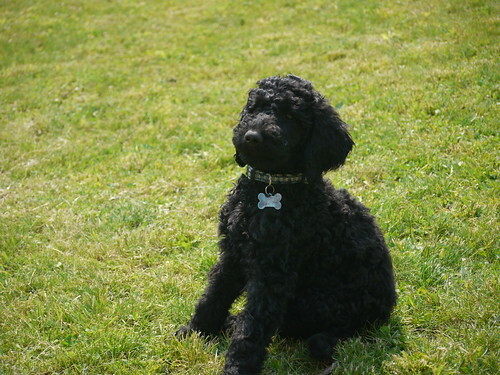 is a 10-week-old standard poodle. And he’s adorable. So adorable that it’s impossible to say his name without the exclamation point. So adorable that Hyla barely glanced at the (old news) goats all weekend. 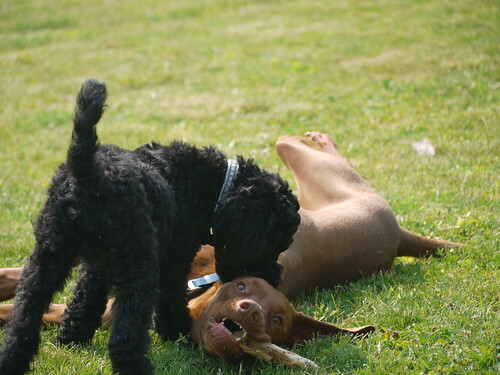 So adorable that Gryfe didn’t mind playing puppy-style all weekend long. So adorable that the cats even emerged from their lair to sniff him (while he slept, naturally). Next Post Does this theme make my blog look boring? 🙂 That he is. And did I mention how soft he is? YOW!